The Coastal Virginia region is comprised of the cities and counties of Chesapeake, Franklin-Southampton, Gloucester, Hampton, James City, Newport News, Norfolk, Poquoson, Portsmouth, Smithfield/Isle of Wight, Suffolk, Virginia Beach, Williamsburg, York County and Virginia’s Eastern Shore. All are accessible by a major interstate highway system, the Chesapeake Bay Bridge Tunnel, and two major airports in Norfolk and Newport News both served by low fare airlines. Coastal Virginia makes a perfect vacation destination for those seeking clean beaches, outdoor recreation, fascinating history, fine arts culture, thrilling events and festivals, abundant shopping and coastal cuisine. Many people do not know where the James River ends. There is a magnificent, wide channel of water that connects the James River with the Chesapeake Bay called the Hampton Roads. The combination of the words as “Hampton Roads” was recorded as the channel linking the James, Nansemond and Elizabeth rivers with the Chesapeake Bay in an act of the Virginia General Assembly in 1755, and they are the main tributaries of the Hampton Roads. The U.S. Postal Service changed its postmark for “Tidewater, Virginia” to “Hampton Roads, Virginia” beginning in 1983. The Norfolk side has the Naval Station Norfolk, the largest naval base in the world. Also, the Virginia International Marine Terminals composed of Newport News, Norfolk and Portsmouth are very important to the area. The Hampton Roads is one of the world’s largest natural harbors — a “roadstead” or “roads,” as applied to a water channel. It is, generally speaking, between the Monitor and Merrimac and the Hampton Roads bridge tunnels. It empties into the Chesapeake Bay leading to the Atlantic Ocean. Depending on the sources of information, the Hampton Roads meets the Chesapeake Bay at points between Old Point Comfort on the north side and Sewells Point to the south. The beautiful, historic Fort Monroe, with its magnificent view of the manmade Fort Wool, are mentioned as meeting points to the Chesapeake Bay, which is the largest estuary in the world. 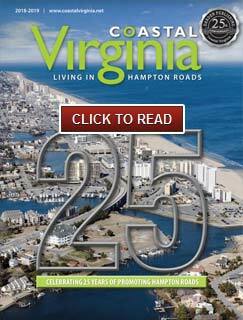 Hopefully, you’ll enjoy learning more about Hampton Roads as you peruse the pages of this magazine. By the time you get to the end of it, you’ll realize what the locals know all too well — Hampton Roads is the place to be for business and family.